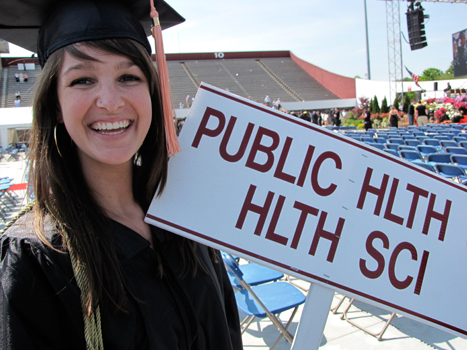 The University of Massachusetts Amherst School of Public Health and Heath Sciences is renowned for combining research and practice that go beyond the traditional academic disciplines. The school offers undergraduate degrees in public health sciences, nutrition, kinesiology and communication disorders. The school also provides graduate students the advanced training needed to become leaders in the public health and health science fields, including master's- and doctoral-level degree options in public health, communication disorders, kinesiology and nutrition. The school also offers a dual degree MPH/MPAA (Master of Public Policy and Administration) and two innovative, fully online MPH degree programs. The online MPH in public health practice program provides working health care professionals an opportunity to earn an advanced degree with flexibility to accommodate their own schedules. The online MPH in nutrition was launched in 2008 and has grown to 51 students and graduated its first class in 2011.